With Yom Kippur coming up this Wednesday, my son reminds me that this teacher planning day is a Jewish holiday. He says, “Memember?” tugging on my shirt, looking up at me. Yes, I thought, I do. I remember it all. How could I ever forget? When he was turning four years old, I searched for a good school because the one he had attended when he was three left him acting like a mini hoodlum. I found a lot of good ones, but they were either too expensive or too snooty. I kept rolling right back to the Jewish Community Center. It housed a small, early childhood education center, and everyone there seemed so welcoming. I’d also heard some wonderful word-of-mouth reviews about the school and read some great articles about it. So, I consulted my husband whose very Catholic parents applauded the idea. They themselves were members of the JCC gym. So, with the whole family’s approval, I confidently registered my son for Pre-K.
Not everything went smoothly. For one, I hadn’t thought about the difficulty of packing a Kosher lunch. But, that wasn’t the most difficult part. It was the part about Christ because, yes, this four year old asked me about it. So, I did what any self-respecting parent would do. I first contemplated lying. After scrapping that pathetic idea, I asked him some questions instead. The answers I got made all the difference. According to him, Christ was a Jew so anyone who was Christian should also be Jewish. I told him that was the best answer to any question I had ever asked. And it was. Not because it fulfilled my desire to avoid an answer I didn’t really have but because it was the kind of answer most adults can’t give. We can’t give an answer because we forget. We forget the real meaning of religion. With all our piety, we forget that religion offers us a set of standards with which to understand our fellow human being, not destroy him. The world we live in right now. This angry, vengeful place we all should share but can’t and won’t. In this world, we refuse to share. That’s the most basic concept we teach a baby. a child. We can’t seem to get past those moments when we first possessed a toy and screamed then cried when another child tore it from our grip. We grow, we learn then we return back to being a baby, constantly craving more. All those babies, screaming over who’s right and who’s wrong, could learn a profound lesson from a little boy. 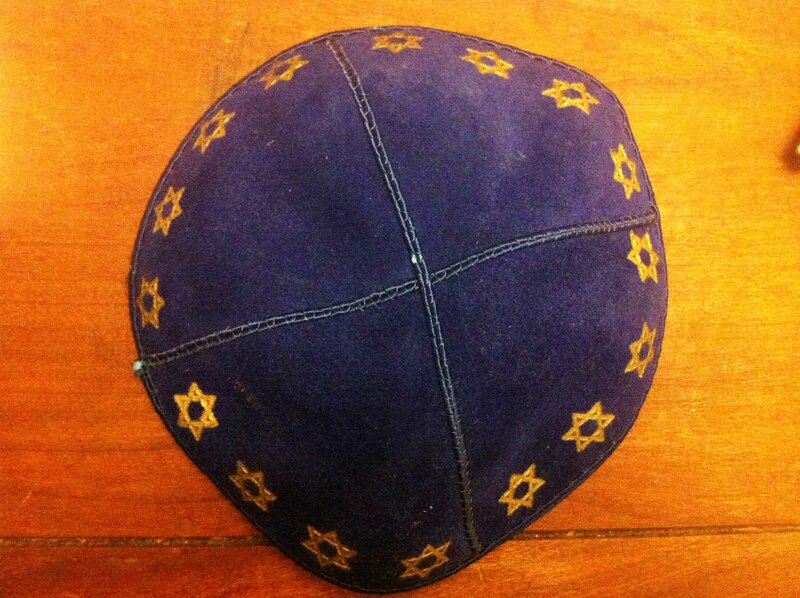 One of my son’s collection of kipas (yarmulke). He will always feel that a piece of him is Jewish. He keeps his kipas or yarmulkes in a drawer and asks me when’s the next Bar Mitzvah. He likes to bring out his menorah placemat during Christmastime. When we’re driving and pass the JCC, he asks when we’re going to visit again. I smile and remind myself we have to go back someday soon. Then, I read the latest news or listen to a report on National Public Radio and I’m reminded of the divide, the extreme, the hell we put each other through because of our beliefs. Instead of proudly admiring my son’s views, I begin to obsess over when he will change. When will he become one of us? Or worse, when will he turn into a baby all over again, screaming for what belongs to him, for what is “right”? The shape of our world feels like liquid in my eyes, things always changing, but there’s a fire burning that the water can’t seem to extinguish. We’re so furious, so hateful. It’s not just religion that fuels this fire. It’s the fact that so many of us lost the true value of it. This is not to say that only a four year old possesses the ability to catapult right over knowledge into power. I do see hope in the wisdom of his grandparents who rallied around my decision to put him in a Jewish school. I saw it in the JCC leaders and members. I see it in those who volunteer their time for various organizations such as Amnesty International. But, for most it’s momentary. The minute we insist we’re right and another person is wrong. It’s gone. So, what if we didn’t try to be right? What if we just tried to make sense of the rights and wrongs by fitting them into each other? Like this little boy, what if we go back to Kindergarten and take our own basic lessons to heart? Every Jewish holiday reminds me to do this. Don’t ever forget. My friends are Messianic. They observe all the Jewish holidays etc.. They call themselves Believers. 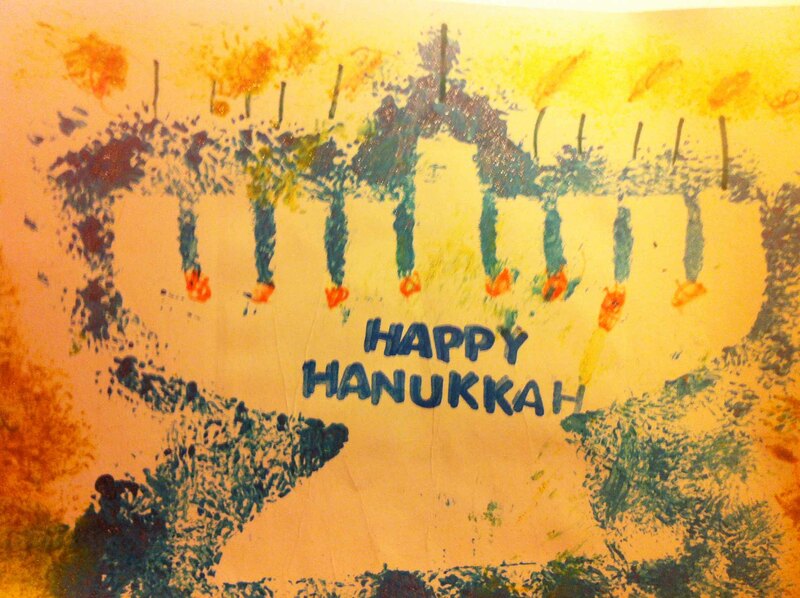 It is amazing and has been very educating for my daughter who grew up on many a Friday nights in their home and then later when she moved to LA, got a job as a nanny while going to school there, working for a wonderful Orthodox French Jewish family. She learned all about Kosher etc… Our kids are our best reflection and the seasoning of the world, we need to allow them to taste the experiences out there. Good for you! Isn’t it though? Every time I feel lost I remind myself or something reminds me that we were once children. Beautiful story about your daughter. I’m so grateful you read this. Thank you for sharing. Oh my, so much I can say in response to this but I’ll keep it brief.. I have been exposed to many religions and although I was raised an Episcopal I embrace some of all. My brother converted to Judaism, so we celebrate some holidays. My children are Bi-racial, so we also embrace Kwanza, I love Buddha principles. Your son’s answer is truly wonderful because it shows us how good humans should act. I have been involved with Amnesty International for almost 15 years and nothing irritates me more than the “bandwagon, flavor-of-the-month” supporters. Like now, more people are concerned with feminists busting in a church and acting rude (they did and we know it), (I think it’s their name people like) than women being stoned in the Sudan, or the religious wars taking place.. It’s so sad.. Mom, you are doing a great job with your son and I’m grateful the world has a child such as him.. I love the Buddhist philosophy too. Thank you for the mom and child comment. I wish for so many changes in the world, but I wonder if it will ever happen. Then I worry as I watch the world pass in high-speed. Always still wishing for more like all the rest of us who keep hoping and pushing and teaching. It’s good to know you’re part of it. This is an amazing post!! Every bit true and so powerful that it takes a child to remind us of it all!! Kids drive us crazy so much of the time, then they give us reasons to remember that they’re such great little beings. Thank you. For your openness, courage and confidence; first in choosing wisely for your son, then in allowing him to grow. Thank you for sharing this. Beautiful. Thank you Gigi for reblogging and your wonderful comments. I feel like many of us are kindred spirits. You know my children call their aunt Gigi. I love your posts, by the way. Powerful post – there’s a line in a song “the thing that’s really sad, we lose the faith we had when we were children.” Interesting bit about Christ – that was the dilemma Paul was asked to solve (do Christians have to first convert to Judiasm) and he said no – Christians don’t have to be Jewish. That meant that Jews started rejecting the Jesus-oriented sect of Judiasm (they let anyone in) and non-Jews started converting in more numbers (men, at least, didn’t have to be circumsized to join!) But the theology behind Paul’s answer (speaking myself as someone who is neither Christian nor Jewish) was in line with your son’s answer — Paul said that new converts still joined the covenant that God made with Abraham, which means yes, they all are in essence Jewish, part of the covenant. Love this post. It’s always the kids thinking rationally, isn’t it? Have you read, “The Life of Pi” This post reminds me a little of the book for some reason. I really like your message on religion. Where it should be a bridge, it has often become a divider. Being spiritual isn’t based on religion, but I think religion should be based on being spiritual. I think spiritual people think God is found less in the bible and dogma, but rather in positive, respectful and loving attitudes towards nature and all living things. We all want harmony and peace within ourselves, our communities and certainly throughout the world, especially now, where it is in such chaos. Wouldn’t that be a wonderful gift. Perhaps living a conscious life where we remember to look to the sides and acknowledge and help each other is religion. Maybe it is as simple as the act of kindness and unconditional love. Perhaps that is when the gap will be bridged. So wonderfully written; your son sounds like a very bright young man. I’ve been considering the Messianic ways for a while, for the same reason your son mentions. But sadly, the fighting and piety you talk of is a massive deterrent from all things religious. You’re right about religion. Oftentimes, it’s just used as a tool for manipulation. The fighting, the egos, they’re everywhere. It feels like a daily trudge to overcome it sometimes. But, I think dialogue keeps us from giving up. interesting post and very well written! I really love blogs like these it opens up to me how different people live their life and think . Beautiful Writing. There is so much more I would like to say but I am feeling short of words. So I’d better just tell you that I love this. Thank you, a million times over. I love reading yours too. We should all look at this as your son does. It would make life simpler and the world would have seen fewer wars. Christ was a Jew. In reality, Christianity is more of a sect of Judaism then a separate religion and even within Christianity there are different sects. After Jesus died, Simon Peter, one of Jesus’ disciples, became a strong leader in the Jewish Christian movement. Later James, most likely Jesus’ brother, took over leadership. These followers of Christ viewed themselves as a reform movement within Judaism yet they continued to follow many of the Jewish laws. In addition to Gnostic, Jewish, and Pauline Christianity, there were already many other versions of Christianity being taught. After the fall of Jerusalem in 70 AD, the Jewish Christian movement was scattered. Pauline and Gnostic Christianity were left as the dominant groups. The Roman Empire recognized Pauline Christianity as a valid religion in 313 AD. Later in that century, it became the official religion of the Empire, and during the following 1,000 years, Catholics were the only people recognized as Christians. Catholics would then wage wars against the Gnostics and later in France Catharism, another Christian sect that was a religious movement with dualistic and Gnostic elements that appeared in the Languedoc region of France and other parts of Europe in the 11th century and flourished into the 13th century. Then this movement was extinguished (a polite way of saying exterminated) in the early decades of the thirteenth century by the Albigensian Crusade when the Cathars were persecuted and massacred and the Inquisition was set up to finish the job. In fact, if we follow the Timeline of Church History, we see that the New Testament Era started about thirty years after Christ was crucified, and then in 325 there were the Seven Ecumenical Councils leading to the Nestorians, the Church of the East; the Oriental, the Copt, Syriac, etc. churches. In 1054, the branch splits again into Roman Catholic Church and the Holy Eastern Orthodox Catholic Church. If we follow the Roman Catholic Church further down the timeline we see more branches splitting with the Lutherans, Anglican, Baptist, Methodist, Old Catholic, etc. Both Christianity and Islam have roots to the Old Testament and the old version of the Jewish religion that goes back to Moses and Abraham. Then we have this: The New Testaments Gospels are palmed off as the work of Matthew, Mark, Luke, and John, four of Christ’s disciples. Yet scholars are perfectly aware “there is no evidence that the Gospels, the Acts of the Apostles, or the other writings, as we have them, existed within a hundred and twenty years after the Crucifixion.” The canonical books of the New Testament came into existence at the same time as the host of “apocryphal” ones, an incomplete list of which comprises over seventy documents. The four Gospels that make up the New Testament were selected by the Church, which pronounced them the true Word of God. Thank you for adding your views with details that most should know but many don’t. Through educating ourselves and others, I think the world would be a very different place. It’s the only reason I’ve remained a teacher for so long. Your input is truly appreciated.